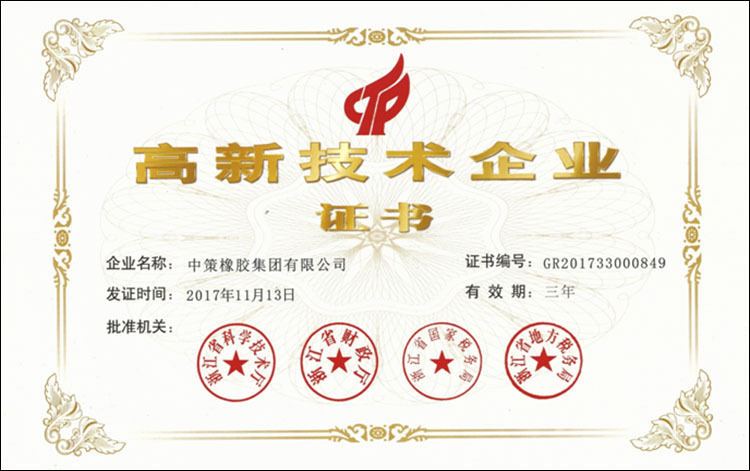 Hangzhou, China — ZC Rubber was awarded as National High-tech Enterprise for its advanced R&D and high technology by Chinese government. The National High-tech Enterprises is a policy of the Chinese government meant to promote rapid development of high-tech enterprises. There are strict standards governing inclusion. “It is our great honor to be the National High-tech Enterprises, which is full recognition of the R & D capabilities and improved technology in the products. It also is a mark of R&D towards a higher level.” Shen Jinrong said, the president of ZC Rubber. The project started in 2016 after a preparing meeting convened by Shen Jinrong,. During the two-year preparing, the company has perfect the innovative R&D system, Headquartered as the center, covering factories in Xiasha, Fuyang, Jiande, Anji, Qingquan and Yonggu etc. The management on every phase of R&D is improved to greatly support the innovation and development in the group. For ZC Rubber, the achieved honor is not only just honor, but also a responsibility that provide more high performance products for customers. As National High-tech Enterprise, ZC Rubber will qualify obtain a series of concessions to help chosen enterprises to do more independent research and development. “Technology is the core competencies to improve the market share in the global. We will invest more on the R&D and strength the capability for the high-quality products with safe and value, to make a sustainable development of our company with the technical support.” The company said.